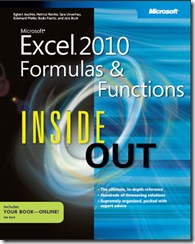 “Microsoft Excel 2010 Formulas and Functions, Inside Out,” $60, Microsoft Press. There are more than 350 functions built into the Excel spreadsheet, and several experts have gotten together here to explain how to use them. Spreadsheets were originally written for accounting but they quickly expanded to enable users to do statistical analysis and probabilities. Their primary use remains the “What-if?” scenario. What if we changed some things like price, size, availability, etc. How would the business change? The answers usually come back in seconds. Believe it or not, experienced spreadsheet users say they’re fun. Readers can search several years’ worth of On Computers columns at oncomp.com. There are new postings every day. Bob and Joy can be contacted by email at bobschwab@gmail.com and joydee@oncomp.com.